Thoracic Cage is a skeletal framework which supports the thorax. Muscles of thorax, upper extremities, back and diaphragm are given connection by this cage. It’s nature is osteocartilaginous and elastic. It has a significant role play for raising or reducing the intrathoracic pressure to ensure a crucial mechanism of respiration i.e. the air is sucked into lungs during inspiration and expelled from lungs during expiration-a crucial mechanism of respiration. The thoracic vertebrae, ribs, costal cartilages, and sternum form the thoracic cage. It gives protection for the internal organs of the thoracic cavity and supports the superior trunk, pectoral girdle, and upper limbs. Twelve pairs of ribs are attached to the thoracic vertebrae. The head of each rib articulates with the costal facet on the body of its own vertebra, and a tubercle near the head articulates with the costal facet on the transverse process. The head also articulates with the costal facet on the body of the vertebra superior to it. 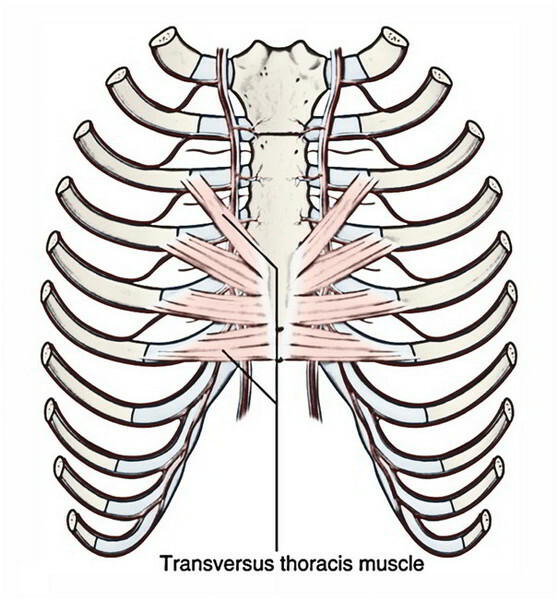 The shaft of each rib curves around the thoracic cage and slopes slightly inferiorly. 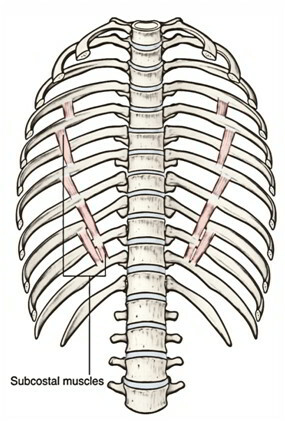 The superior seven pairs of ribs are attached directly to the sternum by the costal (kos’-tal) cartilages, which extend medially from the ends of the ribs. These ribs are the true ribs. The remaining five pairs are the false ribs. The first three pairs of false ribs are attached by cartilages to the costal cartilages of the ribs just superior to them. The last two pairs of false ribs are called floating ribs because they lack cartilages and are not attached anteriorly. The costal cartilages give some flexibility to the thoracic cage. The sternum, or breastbone, is a flat, elongated bone located at the midline in the anterior portion of the thoracic cage. It consists of three bones that are fused together. 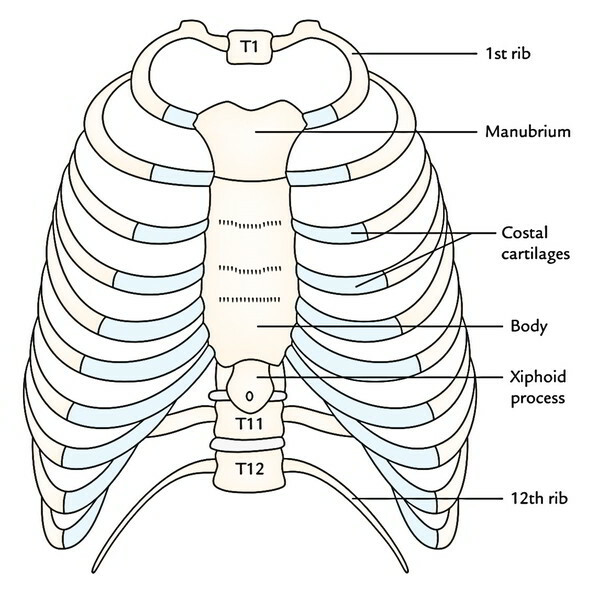 The manubrium (mah-nu’-bre-um) is the superior portion that articulates with the first two pairs of ribs; the body is the larger middle segment, and the xiphoid process is the small inferior portion. A biopsy of red bone marrow may be made by a sternal puncture because the sternum is covered only by skin and connective tissue. Under local anaesthetic, a large-bore hypodermic needle is inserted into the sternum, and red bone marrow is drawn into a syringe. Posteriorly: by 12 thoracic vertebrae and intervening intervertebral disks. Laterally: by 12 pairs of ribs and related 12 pairs of each side: costal cartilages. The rib cage is composed by sternum, costal cartilages, and ribs connected to the thoracic vertebrae. All the ribs joint together with the thoracic vertebrae. the upper 7 ribs (lst-7th) joint with the side of sternum via their costal cartilages. he next 3 ribs (example, 8th, 9th, and 10th) joint with every other via their costal cartilages. 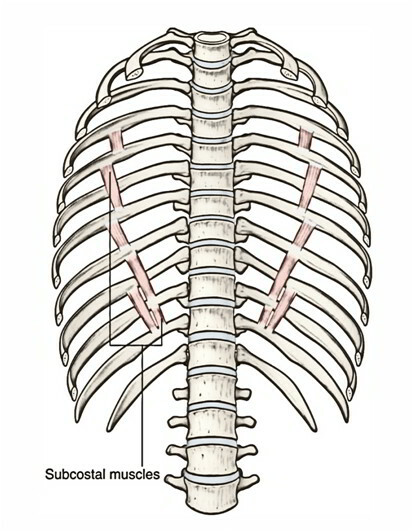 The lower 2 ribs (example, 11th and 12th) don’t joint and anterior ends of their costal cartilages are free. The costal cartilages of 7th, 8th, 9th, and 10th ribs create a sloping costal margin. The diaphragm is dome shaped with its convexity pointed upwards. Therefore, the upper abdominal viscera is located inside the thoracic cage and are shielded by it. In life, the upper end of thorax seems broad as a result of presence of shoulder girdle created from clavicles and scapulae and related scapular musculature. The thoracic cavity is truly considerably smaller than one presumes because the upper narrow part of thoracic cage seems broad (vide supra) and lower broad part of thoracic cage is encroached by the abdominal viscera because of dome-shaped diaphragm. External intercostal muscle (superficial layer). 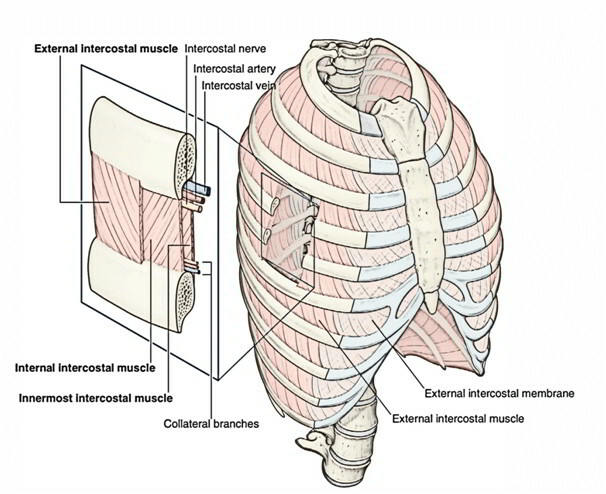 Internal intercostal muscle (intermediate layer). The muscle layer is lined by the endothoracic fascia, which in turn is lined by the parietal pleura. These 3 layers of muscles are comparable to the 3 layers of muscles in the abdominal wall. The intercostal nerve and vessels create neurovascular bundle is located between the intermediate and deep layer (neurovascular plane). Along with the above mentioned 3 intrinsic muscles there’s another group of muscles named levatorescostarum. Every muscle stretches in the intercostal space from tubercle of the rib behind to the costochondral junctionin front, where it’s replaced by anterior intercostal membrane. It appears from the lower border of the rib above and added into the outer lip of the upper border of rib below. The fibres of the external intercostal muscle are pointed downwards, forwards, and medially (in the posterior part but, the fibres are pointed downwards and laterally). By intercostal nerve of precisely the same space. The external intercostal muscles elevate the ribs during motivation. Every muscle goes in the intercostal space from the lateral border of sternum in front to the angle of rib behind, where it’s replaced by the posterior intercostal membrane. It originates from the floor of the costal groove of the upper rib and inserts into the inner lip of the upper border of the rib below. Its fibres are pointed upwards, forwards, and medially (i.e., at right angle to those of external intercostal muscle). The internal intercostal muscles elevate the ribs during expiration. It takes up the middle 2-fourth of the intercostal space. It appears from the inner surface of the rib above and inserts on to the inner surface of the rib below. It’s same as those of internal intercostal muscles. By intercostal nerve of the exact same space. The intercostal intimi muscles elevate the ribs during expiration. The subcostalis muscle is located in exactly the same plane as the intercostalis intimus in the posterior part of the intercostal space. It intercedes between the intercostal nerve and vessels, and pleura. It originates from the inner surface of rib near the angle and inserts on the inner surface of the 2nd or 3rd rib below. It’s same as that of the internal intercostal muscle. The sternocostalis muscle 1 on either side is situated on the inner aspect of front of the chest wall (behind the sternum and costal cartilages) inhabiting the anterior part of the upper intercostal spaces, with the exception of the very first space. The sternocostalis muscle intervenes between the anterior end of the intercostal nerves and the pleura. It appears from (a) lower 1-third of the posterior surface of the body of sternum, (b) posterior surface of the xiphoid process of the sternum, and (c) posterior surface of the costal cartilages of lower 3 or 4 ribs. The fibres diverge upwards and laterally as slides to be added into the lower border and inner surfaces of the costal cartilages of 2nd-6th ribs. It draws down the costal cartilages where it’s added. These are a series of 12 small muscles put on each side of the spine of thorax, just lateral to the vertebral column. It originates from the tip of transverse process from 7th to 11th thoracic vertebrae. Every muscle enters obliquely downwards and laterally to be added on to the upper edge and outer outermost layer of the rib immediately below in the separation between the tubercle and angle. Elevate and rotate the neck of rib in a forward way.